We’ve all done it at some point in our lives – misplaced the car keys, forgotten someone’s name or walked into a room and realised you can’t remember why you went in there. Lapses of memory are quite normal, particularly when you are juggling several tasks or preoccupied with stress. But for millions of people across the UK, symptoms such as memory loss, confusion and problems with speech and understanding can be a result of dementia. Dementia is a general term which refers to various brain disorders that trigger a loss of brain function. These conditions tend to be progressive and eventually become severe. According to the Alzheimer’s Society, there are 850,000 people with dementia in the UK, with numbers set to rise to over 1 million by 2025. Alzheimer’s disease is the most common type of dementia, affecting 62 per cent of those diagnosed. Other types of dementia include vascular dementia and mixed dementia. Dementia is a terminal condition but research is constantly being uncovered on ways to protect the health of your brain and reduce the risk of developing this condition. Good dietary choices, the right supplementation and even lifestyle changes have been shown to reduce your risk of developing dementia. Here we speak to the experts to find out the best natural ways of supporting the health of your grey matter. Cut out stress – and caffeine! “Meaningful and engaging activity is a key tool in improving the quality of life for people with dementia,” says Ben Atkinson-Willes, founder of Active Minds (www.active-minds.co.uk). “Research has clearly shown keeping the brain active helps to reduce depression and sleeplessness as well as encouraging conversation and connection with family and friends.” Keep your brain fit and active by playing cards and chess games, reading books, doing crosswords or learning an instrument or new language. “There has been a great deal of research in the last 10 years to show that physical activity can help brain function,” says Dr Glenville. “One study of a group of women tracked their level of physical activity over eight years. The researchers found that those women who were the most active had a 30 per cent lower risk of cognitive decline. What was interesting was that it was not the intensity of the exercise that made the difference but the amount. So, with walking, the distance the women walked was more important than how fast they walked.” Yoga has also been shown to benefit the health of our brains. Research published in the Journal of Physical Activity and Health revealed that 20 minutes of yoga practice can help to improve brain function. A group of 30 people took part in a 20-minute session of hatha yoga before performing a series of tests designed to monitor their ability to focus and retain new information. The yoga practice was found to “significantly improve” their speed and accuracy during the tests. 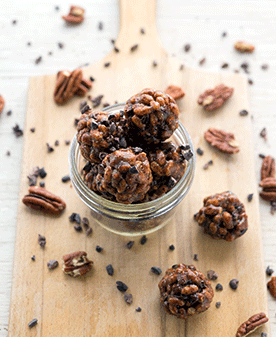 Pecans have high levels of the antioxidant vitamin E that protects fat cells from oxidation, as well as choline, which ensures optimal brain function and boosts your memory. Raw cacao has been shown to increase levels of specific neurotransmitters in your brain that help promote a positive outlook, facilitate rejuvenation and lift your spirit. Combine all ingredients in a large mixing bowl and mix well with a spatula. Form into bite-size balls on a serving plate or parchment paper. Put in the freezer for 10 to 15 minutes to firm up. Take them out and enjoy! Recipe taken from Eaternity: More than 150 Deliciously Easy Vegan Recipes for a Long, Healthy, Satisfied, Joyful Life by Jason Wrobel (£16.99, Hay House).